Now, let us look more deeply into Injection moulding process. The plunger screw type plastication unit may be further subdivided into those with and those without reciprocating movement. The fully hydraulic mould clamping mechanism is preferred today. The essential advantage of screw plasticating machines is the very short cycle time which is very important for high volume production, e.g. using rotary table mould arrangements. One of the requirements for automated rubber injection moulding is to produce a rubber compound of the highest possible uniformity, which is still quite a difficult task even today. Other important factors depending on controlled mixing are those of optimum and uniform reheological properties, the dispersion of the ingredients in the compounds, and computer-aided optimization of the vulcanization process, especially for thick-walled moulding. Compounds with consistent processing properties can now be produced using automatically controlled internal mixers. Another problem is that of automatically feeding the raw material into the injection moulding machine. The strip feeding method in its original form is too imprecise and needs constant manual attention. Recently, however, the strip feeding method has been refined by using strips of precise dimensions wound on drums, allowing limited periods of automated production. Another method used is to feed the compound into the injection moulding machine in granulated form. This may prove to be the best method for fully automated production in the future. What rubber to use ? How to adjust machine controls ? What end properties to expect ? Injection moulding is specially suitable for the mass production of high quality precision components. For a given barrel temperature, the higher the heat build-up the shorter the cure time. Alternatively, for a fixed injection temperature, the higher the heat build-up the lower the temperature at which the barrel of the machine may be set thus minimizing the danger of premature vulcanization (scorch) in the barrel. Injection moulding process for elastomeric compound have certain specific advantages over the moulding process. In Compression and Transfer moulding, elastomer is pushed into the mould cavity gradually as the mould closes. Therefore in the process, though the elastomer gets in contact with the hot surface of the mould , it is not subjected to any pressure, which is created when the mould is at closing face. For vulcanization, both temperature & pressure are required. In injection moulding, mould first closes fully and elastomer is pushed into the mould with high speed. The cavity of the mould is very quickly filled and a pressure is developed within a very short time, thereby, triggering the process of vulcanization. In compression moulding process or in transfer moulding process, the flow of material stops immediately when the mould is completely closed. Therefore, typical problems like generation of small gases and vapour, shrinkage of elastomer after vulcanization cannot really be rectified in the above process. In injection moulding machine there is always a special feature which is known as Post Injection Pressure. Even when the cavity is completely filled and the process of vulcanization has started, the injection unit still continue to push in the elastomer compound for a reasonable length of time ensuring completely porosity free moulding. Allow automation to be introduced into the moulding operation. Simplifies preparation of rubber: cutting, shaping and weighing of blanks eliminated. Materials, trimming and inspection costs reduced. Product quality improved: better dimensional control and more uniform physical properties. Cure time is considered as a measure of productivity obtainable. This is the time elapsed between injection and opening the mould. For a given set of operating conditions, cure time depends on the thickness of the product. Early work showed that barrel temperature was one of the most important factors affecting injection temperature. As Screw speed increases, rubber in the barrel of the injection machine becomes hotter and it is possible to obtain higher injection temperatures and shorter cure times. Cure time, assessed by the hardness of the top, center and bottom of the moulding, closely follows the injection temperature and illustrates that under the prevailing back pressure and barrel temperature conditions there is an optimum screw speed. Injection temperature increases with elevation of barrel temperature. When there is no screw delay in operation, temperatures above optimum level causes premature vulcanization of rubber in the barrel. Screw-back pressure is the adjustable hydraulic pressure which acts to pressurize the plasticized rubber in the injection chamber during screw rotation. Injection temperature increases with screw-back pressure. As the Nozzle orifice diameter is reduced, the injection temperature rises but, below a diameter of 2mm (0.075 in), it levels off . With a relatively wide nozzle orifice (3.2mm; 0.125 in), an increase in the injection pressure gives a steady rise in injection temperature and a useful reduction in injection time. Machine manufacturers advise use of 80-90 percent of the maximum available pressure to save wear and tear on the machine. The principles of successful compounding for injection moulding follow the normal rules. The choice of curing system determines properties such as scorch rate, cure rate, reversion resistance, modulus, strength, resilience and ageing resistance. Control of mix viscosity can be used with caution to optimize mould filling time and hence cure time. Required stiffness, strength and cost can be obtained by selection of filler at an appropriate volume loading. Physical properties (tensile strength, modulus, etc.) of injection moulded components can be expected to be very similar to those made by compression moulding although the modulus of injection moulded samples may be equal to that of compression moulded samples, the tensile strength tends to be higher. There is also published evidence that injection moulded components are similar to or better than compression moulded ones in respect of elongation at break, tear strength, hardness, resilience and oven ageing resistance. There have also been claims that in some circumstances certain properties (e.g. Dynamic properties ) of injection moulded products are superior. Particular interest attaches to the injection moulding of thick components such as engine mounting and shock absorbers – traditional high-quality natural rubber products. The greatest benefits of injection moulding are obtained when moulding thick sections since injection at high temperature saves the time required to heat rubber by the relatively slow transfer of heat into a mix of poor thermal conductivity. Compound with higher Rubber Hydrocarbon content (RHC) is preferable for injection moulding process. Transport and storing of the cut reforms is eliminated. Considerably shorter vulcanization times because of homogeneously preheated material. More homogeneous degree of vulcanisaiton of the finished part at high injection temperature. These advantages are contrasted by the disadvantages of considerably higher investment costs for moulds and machinery. The injection moulding process can not also handle as high volumes as compression moulding. Which method is most economical for the production of moulded parts, compression moulding with low investment costs but with higher production costs or injection moulding with higher investment costs, depends to a high degree on the number of parts to be produced. Below certain limits it is advantageous to work with low investments but higher wave costs while for high volume production runs higher investments may be preferable. However, considering improvement in product quality leading to higher performance and longer life made by injection moulding process, it is preferable to go for the same. Taking into account of all factors associated with injection moulding, namely – Capital Investment, higher precision of working, higher (improved) compound cost, Qualified & experienced Technologist needed etc. would lead to a higher cost of the finished product. Besides choice of Machine & Process one has to keep in mind that performance of a rubber product depends on many other factors which need equal attention. These are, for example, for certain metal to rubber bonded items used by Indian Railway. Environmental condition – Oxygen, Ozone, Fatigue, Displacement Amplitude etc. Rheometer provides cure characteristics information but does not indicate mixing quality . Summarizing, it is quite clear that only particular machine or process usage will not lead to improved product performance but combination of all related points development is essential to achieve the desired goal. Any specification should be drawn only after ascertaining the results of these studies. Categories: Moulding Machinery, Non-Tire Rubber Industry | Tags: Compression moulding, injection moulding machine, moulding machine, rubber moulding | Permalink. Here is an informative piece on injection moulding of rubber products. 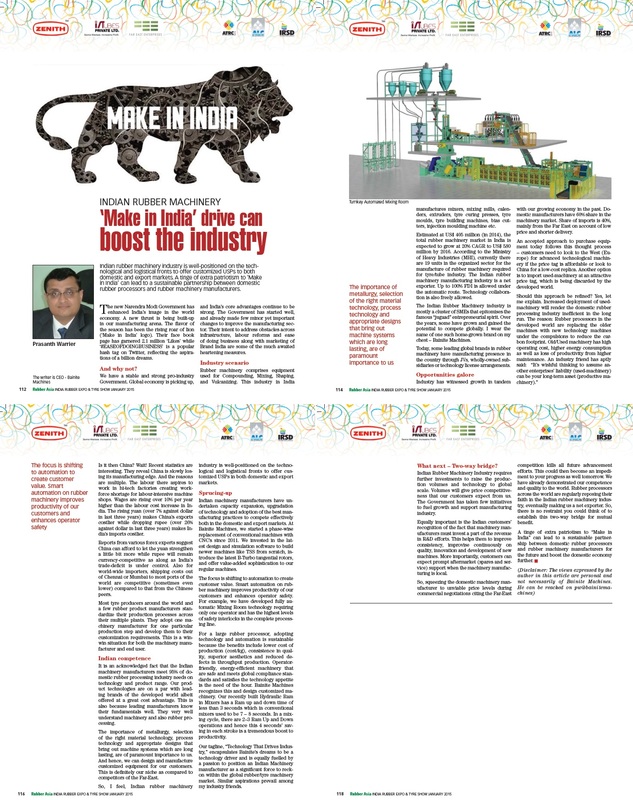 This article is sent to me by Dr.S.N.Chakravarty, President – Elastomer Technology Development Society and Ex-Chairman, Indian Rubber Institute (IRI). Moulded rubber products, including rubber to metal bonded items, are manufactured by following process world-wide. Choice of process depends on different factors like Product Geometry, Type of Polymer, Volume, Cost Vs Market Price realization, Manpower & Space etc. All the process are well established and widely used. Each process has certain advantages & disadvantages. To get optimum result, you all need suitably developed compound & manpower besides right machine & process. Compound is developed to meet requirement of laid down specification including special requirement (e.g. dynamic fatigue, heat development, tear resistance, load deflection, etc.) and retention of properties on ageing for specific period at elevated temperature. The later indicates approximate idea for product performance & life. All these obviously have bearing on cost factor. For different moulding process three major properties or compound behavior is to be considered – Compound Flow Characteristics, Mooney Viscosity and Scorch Characteristics. Each process calls for adjustment of these parameters for suitable working. Primary purpose of moulding is to provide shape & size of the product. Porosity & Knit in the product are to be avoided. Porosity is caused by moisture in the compound & moulding pressure and Knit by improper compound flow. In case of Compression moulding, preparation of Blank (shape, size, weight) plays important role to control mould flow / avoid air entrapment and excess flash. This point is not necessary for Transfer or Injection moulding where feeding system & wastage of semi-scorched compound are more important factor. Injection Moulding is an important processing technique for converting elastomeric materials into final products. The injection moulding machine automatically performs: raw material feeding, heating, polymer mix plasticization, and mould injection; all operations are performed under controllable conditions of temperature, time, speed, and pressure. Some peculiar problems arising during injection moulding are associated with the drastic change in rubber compound rheological properties which occur upon vulcanization. In particular, during the filling stage, the rubber compound in the mould-filling process. This is a phenomenon that may lead to the loss of processability of the rubber compound and incomplete mould filling. Rubber compound or thermosets go through an irreversible chemical change during the forming process. Thus, the critical issue in modeling the injection moulding process for such polymeric materials, is developing a viscosity model that can accurately describe the reheological and chemo-rheological behavior. As Injection Moulding of Rubber compounds becomes an increasingly important moulding process, an understanding of the nature of coupling the rheological behavior with cure kinetics of rubber compounds and the process itself becomes paramount. Effective control of product quality, as well as the ability to optimize moulding conditions, will depend on a further development of such an understanding. During Injection Moulding, the Rubber compounds are subjected to high shear rates and as a result experience a thermal history leading to chemical reaction (cross linking). It is recognized that the processibility of a rubber compound is predominantly determined by its viscosity which is balanced by tow effects: the drastic decrease in viscosity with increasing shear rate: and a significant increase in viscosity following the onset of vulcanization. Thus, different rubber compounds not only display different rheological properties, by also possess different chemo-rheological behavior. It is seen that an increase in the inlet temperature does not significantly reduce the cycle time needed to reach a specified cure level. One cannot further raise the inlet temperature to achieve a shorter cycle time due to the possibility of curing in the barrel. Therefore, the distribution of state-of cure in the moulded rubber articles is strongly dependent upon the mould temperature and less dependent upon the inlet temperature. It is interesting to know how the injection speeds affects the state-of-cure achieved during the same mould cycle duration. For this purpose experiments were conducted in which the injection speed was set at a definite speed. At this injection speed the calculation shows that there is no cure during the filling stage. A comparison is made between the predicted and measured gap-wise distribution of state-of-cure in mouldings obtained where cure occurs during filling by lower injection speed, and where it does not occur during filling at higher injection speed. In the later case, the ultimate state-of-cure achieved in the cure stage is the overall state-of-cure achieved during entire moulding cycle. In the case when cure occurs during filling, the overall state –of-cure for the entire moulding cycle is the state-of-cure at the end of filling plus the state-of-cure further developed during the cure. Surprisingly, both experimental and predicted gap-wise results show that a higher stat-of-cure is obtained at higher injection speed for the same moulding cycle. This can be explained by the fact that the rubber material gets into the cavity much faster and therefore has a much longer time to cure in the cavity. The development of the state-of-cure in the post-filling stage indicated that the mould temperature and injection speed strongly affected the evaluation of state-of-cure within the moulded parts. The effects of the inlet temperature on the state-of-cure was found to be insignificant. With the increasing demands for high quality and productivity in injection moulding, it has become more important to keep consistently constant dimensional precision. Various properties of polymer such as melt fluidity and density are dependent highly upon temperature. Therefore the consistency in quality is primarily dominated by the temperature variations of mould wall and / or polymer in the barrel. Fluctuations of these temperatures, however, are indispensable to some extent, due to the heat exchange among polymer, mould, machine and environment, and transient temperature change at the start-up, etc. An adaptive holding pressure control system was developed to get constants product weight by changing holding pressure adapted to the temperature variations. In Part 2, you will look more deeply into Injection moulding process. Categories: Moulding Machinery, Non-Tire Rubber Industry | Tags: injection moulding machine, moulding machine, rubber moulding | Permalink.